I would like to introduce one of La Mesa’s unsung hometown heroes — John Bryant. Every morning, John gets up and dresses, dons his reflective vest and with bucket and grabber in hand goes out in search of trash. He cleans up the entire Murray Manor Apartments as well as both sides of Cowles Mountain Boulevard from the 5800 block to Lake Murray Boulevard and both sides of the 5600 block of Lake Park Way from Cowles Mountain to Baltimore. He picks up everything from cigarette butts to cans and bottles to fast food wrappers and bags. He does not keep the recyclables but gives them to one of the maintenance workers at Murray Manor. Why does he do this? It is his way of giving back to the community. He does so without any pay or benefit. (Some years ago I prevailed upon Mayor Art Madrid to give him a certificate of appreciation which was presented to him by Mayor Madrid and myself at his apartment). I have lived on Lake Park Way since 1991 and have seen John in the neighborhood for a long time. I am sad to admit, I initially thought of John as one of the mentally-challenged crazies that dot the La Mesa landscape. I, like many do, avoided John because he looks kind of scary. He staggers more than walks and cannot stand up straight. He has difficulty speaking and has trouble modulating his voice. He is hard to understand. One day I was in the Village and a car pulled up and the driver lowered the passenger window and leaned toward me. To my surprise it was John. I thought he was too physically challenged to drive a car. He recognized me from the neighborhood and stopped to ask me if I knew where a certain store was. From that point on, I took the time to talk to and get to know him. John is intelligent and has worked his entire adult life. He has lived at Murray Manor since it was built in 1971. His physical disabilities are the result of a birth gone wrong. He is a kind, generous and patriotic soul who gives back to his community while few give back to him or even acknowledge him. I have witnessed many people react negatively to him, just as I did. Some fear him or make fun of him. Many know of him but have never talked to him. John can often times be seen walking the neighborhood and the shopping center with the dog he shares custody of named Dexter. He, in my never humble opinion, is a true hero. He has no reason to give back to a community that, for the most part, has ignored or avoided him. He worked hard for little pay as a maintenance man in the slimy underworld of the nursing home industry. (Note that I don’t have a very high opinion of nursing homes as I have vast experience with the industry, which is another story). I would like people to meet John and see for themselves what giving to the community is all about. 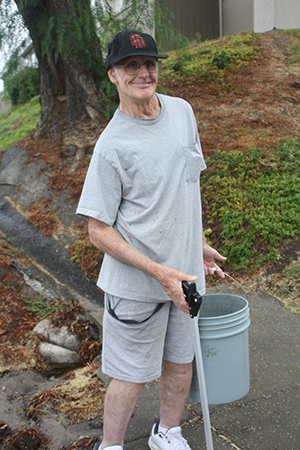 John can be found seven days a week, 365 days a year (even when it rains) between 6:30 and 8:30 a.m. on Cowles Mountain Boulevard or Lake Park Way. He is easy to spot with his distinctive shuffle, tilt to one side and his bright reflective vest. Take the time to meet John, and know what a treasure he is. —Clarke A. Stillwagen is a long-time resident of La Mesa who has held a variety of jobs in the area over the years but is now retired. Reach him at casvks@gmail.com.